You've heard it, we've heard it. We've all seen it play out on 24-hour news cycle after news cycle. "The Ebola threat is real," right? As planners of international travel, we've definitely heard the hype. And since the first cases in West Africa were publicized, you can trust that we've kept ourselves educated on the issue as much as possible. For the record, this blog post is not meant to play down the danger of the very real Ebola outbreak, nor the hardship that the people of Guinea, Sierra Leone, Mali and Liberia are enduring. Its goal is to educate international travelers on the actual dangers they face, and to quench fears of a largely avoidable threat. of an infected person's bodily fluids (blood, saliva, mucus, vomit, urine, or feces) with your eyes, nose, mouth, or open wound. According the the Center for Disease Control and Prevention, "there is no evidence indicating that Ebola virus is spread by coughing or sneezing." Unless you've directly rubbed an infected person's bodily fluids on your person, there is little chance that you have Ebola. Furthermore, the nature of the symptoms presented by Ebola patients makes it improbable that you've come in direct contact with them. In other words, if someone has Ebola, they're probably in a hospital and are unable to move. The dreaded scene of a coughing, sneezing man bumping into you on the street, is simply unrealistic. 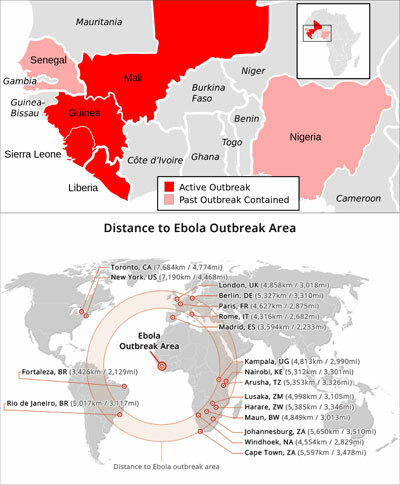 Referring to the map on the right, provided by a very thorough Wikipedia article on the outbreak, we see the countries that have been affected by Ebola since 2013. We can see that the countries affected make up a tiny section of the African continent. See Nigeria colored in light red? Yeah, it's twice the size of California. Think about that, and realize that the distances between Guinea and popular tourism destinations of South and East Africa are immense. Africa is big. It's much bigger than many of us tend to give it credit for. And traveling to Tanzania while worrying about Ebola in Sierra Leone is like traveling to Los Angeles and worrying about Ebola in Buenos Aires. Yeah. Look up the distances yourself. Africa is, indeed, huge. Our tour partners in Africa are almost all changing their cancellation policies to reflect this concern. We should all understand that these partners are all so confident that their countries are well-protected from such an outbreak, they're willing to wave ALL cancellation fees should there be an Ebola outbreak in their country. That's confidence, people. Travel insurance policies across the industry are not covering Trip Cancellation for Ebola outbreaks as a reason for a full refund. If you absolutely feel you need to be 100% protected against this possibility, ask your agent about Cancel for Any Reason coverage. The reality here is that Ebola simply should not be a concern for our northern, eastern and southern Africa travelers. We've even received concerned emails from our travelers to Asia and Latin America, and honestly, we're pretty shocked. This unfounded fear has had an effect on travel from Costa Rica to Thailand. Obviously, Global Basecamps has a horse in this race. We'd rather our travelers, you know... travel. But our other priority is the communities that our travelers support through their tourism. Conservation efforts are funded directly by tourism, and a drop in tourism only means the endangerment of more communities and national parks. The greater injustice is when these local communities are unjustly harmed by news stories half a world away.